Anyway, two thumbs up for AMY’S! Right on, Bionaturae! And thank you for labeling it! I didn’t email Eden Foods about BPA free cans because they disclose the BPA information on their website! It’s interesting to read how Eden Foods pioneered BPA free can, too. Thank you, Eden Foods! Only the tomatoes are in cans with BPA linings at this moment. But they DO have tomatoes in glass jars. A lot less contamination from BPA lining of the lid than the BPA lining from the can. However, I still haven’t found this at the Whole Foods. Have you? You can order organic tomatoes in the amber glass jar from Eden Foods’ website or a dozen of 14 Oz. 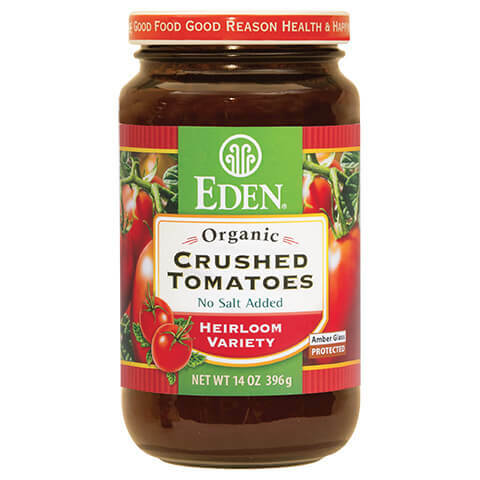 Eden Foods Organic Tomato (yes, buy a dozen in a case!) or a dozen of 25 Oz Crushed Organic Tomatoes from Amazon.com ! There’s no Fresh and Easy in my neighborhood. The closest one is about 5 miles away! OK. So it’s sort of in my neighborhood. But I just don’t go to that area. Not that I don’t like it. It’s just not in my route. Anyway, as per a request by a precious reader, I sent a message to F&E through their contact form online. F&E replied to my email within a few hours! WOW. Thank you, Fresh and Easy! Muir Glen believes BPA is safe but they have removed BPA from their cans. Yay! Thank you, Muir Glen for listening to your consumers! 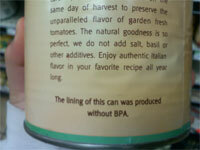 “As of October 2011, Muir Glen canned tomato products do not utilize BPA in product packaging. I’ve heard all of Native Forest Brand‘s canned foods are BPA free. I guess they (all bloggers out there) meant most of them are BPA Free! Anyway, thank you, Native Forest for listing all your BPA free products for me! “Thank you for contacting Edward & Sons Trading Company with your question about BPA and metal cans. Please know that food safety is as important to us as it is to you and your family. Metal food and beverage cans have a thin coating on the interior of the can surface, which protects from corrosion of the can and contamination of contents by dissolved metals (UK FSA, 2002). Our research indicates that BPA is currently present in most linings of tin cans, jar lids, and other types of packaging. Some consumers fear that BPA injestion may disrupt normal hormone functions and FDA has specified a very low level of permissible BPA migration. We at Edward & Sons are mindful of customer concerns and continually work to advance packaging improvements. We direct our packing facilities to select cans with no detectable levels of BPA. While some packaging suppliers offer what they describe as BPA-free cans, we perform independent tests to validate their claims. As of 12/31/2011, all of our can linings have been tested by a licensed, domestic third party laboratory for Bisphenol A (BPA) using a High-Performance Liquid Chromatography (HPLC) method. The following cans showed “no BPA detected” when tested via HPLC Method. The limit of detection (LOD) for BPA with this analysis is 0.2 parts per million (ppm). specific test results and do not make any additional warrants or claims, except our pledge that all products comply with applicable FDA regulations. Packaging evaluation and improvement is a work in progress and we sincerely appreciate your patience and support. Nijiya Market is a Japanese food store chain in the US that has their own organic farm in California and has Nijiya Brand products that are usually organic as well. There is only one canned product in Nijiya brand – It’s tuna. But this is my go-to market for Japanese food ingredients. So I thought I should check it out. I could copy & paste the email I received. But it was in Japanese. So I’ll just summarize what it says. Nijiya Market Brand canned tuna is NOT in BPA Free cans. However, they follow EU regulation (60 parts per billion max) for BPA. EU’s regulation on BPA is tougher than US (600 ppb). So the BPA level in canned tuna should be low. But again it’s not BPA free. FYI, the mercury level in their canned tuna is less than 0.001ppm. That’s very low!! Also, I’m not sure you eat natto (you probably don’t eat it unless you are Japanese or follow macrobiotic diet) but Nijiya Brand organic natto is in BPA free containers! Woo hoo! “Thank you for your inquiry. We do not make a BPA free statement however our canned products are 9 parts per billion in the can lining as opposed to the accepted FDA safe level of 600parts per billion. We are moving to a BPA free container in the future . From the legal dept of our canned foods supplier: Our suggested term is non-Epoxy, which means that BPA will not be a part of the initial can, but as you know BPA is now present in our world and will take years to disappear from water, soil and other places before we can say BPA free. Having produced this summer we will begin to see this “non-intent / non-epoxy” container in your stores on or around February/March of 2012 due to carryover complexities and partial non-epoxy/non-intent packs. BPA is in all packaged food container unless otherwise stated on the item. You will find this in cans including coke and beer, all glass lidding and many plastics. Well, thank YOU, Spouts! This is very helpful! “First and foremost, thank you for taking the time to contact us, and please accept my apology for our delay in response time. We experienced an unexpectedly high volume of calls and emails this holiday season, and we are still playing catch-up – but that is no excuse. Regarding foods packaged in Tetra, all Tetra Pak is BPA-free. All of our canned fish, chicken, and beef are now in BPA-free cans EXCEPT: sardines, crab, Cherrystone clams, & oysters. Our suppliers are working on a 2012 BPA-free solution for these exceptions. All of our canned fruits and vegetables (including but not limited to tomatoes, beans, and the organic canned pumpkin, which is a seasonal item) are in BPA-free cans EXCEPT: mandarins, hatch chilies, artichokes, organic baked beans. We are working on an early 2012 BPA-free solution for these products, as well. Coconut Milk is also in a BPA-free can. Some further info: every glass jar item has a metal lid. All metal lids DO have a layer of BPA coating, but there is coating of another material put on top of the BPA coating. Thus, there is no direct contact of BPA to food. We have conducted multiple supplier testing results showing there is no BPA detected from metal lids. Also, all of our canned soups and stews (including Joe’s Os) are in cans that DO have BPA. Some of our suppliers are expecting they will be able to make transition next year. “Thank you for your recent inquiry regarding our O Organics and Open Nature products. “At this time we are not able to answer your specific question about which of our products are packaged in non-BPA cans. Because there is a shortage of non-BPA cans as compared to the sales of canned products on the market at this time, the cans that our suppliers use can change based on what is available to them. The overall percentage of our products packaged in non-BPA cans is 27%, and going forward we will not be accepting any new canned products with BPA in the lining material. Whole Foods is still one of my fave stores after reading this email and watching this “It’s Getting Real in the Whole Foods Parking Lot” video (that’s my WF he is rapping about, yo!). Yes, I’m disappointed that they don’t disclose the list of their 365 brand BPA Free products. But compare to other supermarkets, they carry a lot more organic, locally grown, sustainable products, have a big bulk section (usually), discourage their customers to use single-use disposable supermarket bags by charging 25¢ per paper bag and giving back 10¢ per bag to customers who brought their own bags, and Whole Foods have coupons most of people don’t use or don’t know about (be smart and use them) and on and on! So I don’t want to say bad things about them, yet. However, I want YOU to email them you want Whole Foods 365 Brands to be BPA free, but not in a mean way. So if you’d like, contact Whole Foods Market by using their on-line response form! “Thank you for taking your time to write us with your question. Our sardines are in BpA free-lined cans and our pouches are BpA free lined. Our glass jars do have BpA in the lid lining, but the content seldom contacts the lid. Wild Planet aims to convert all of its canned products to cans with BPA-Free linings. As a result of Wild Planet’s rigorous testing protocol, we have recently discovered that the cans we have been using for our albacore and skipjack tuna have been found to contain trace amounts of BPA, despite the supplier’s certification and assurance that they are BPA-free. Until we have conclusive results from a second round of testing, we have elected to remove the BPA-Free mention from our albacore and skipjack cans labels. In the interim, we are working on sourcing cans from other suppliers and testing those, regardless of the certification provided. We do apologize for the confusion for this might have caused however at this moment only our line of sardines have tested BpA free-lined. Our crab and shrimp are high acid and the canning industry is still working on an alternative to BpA free lined cans for high acid foods. So they are still in BpA lined cans. You are right, our albacore tuna does have less mercury, on the average it is about 0.17 parts per million (ppm), our skipjack is 0.08 ppm and major company brands run between 0.35 to .45 ppm on the average and FDA max requirement is 1.00 ppm on average. The other great thing about our tuna that it is once cooked, which means everything in the can is fish product and eatable which gives us such high Omega numbers. Please don’t drain the liquid in the Albacore or Skipjack cans. Send an email to the company! It only takes a few minutes of your time to save your life! So it was not like I was trying to keep it a secret. I just didn’t think about sharing this with strangers. I just wanted to organize the information I gathered somewhere like Google Doc. Then I thought, “why not share this info with people who want to know?” Wordpress, Blogger, and all kinds of blogs are free for us to use! To top if all off, I was the one who was Googling about this information and frustrated that the blogs and news that have BPA free canned foods information do not offer detailed information. That was how I got deceived! Well, the “deceive” is not a right word. I don’t think any of them represent canned food companies or anything. But I got the information from a very acclaimed environmental blog site (you are hugging what?). Some bloggers are just blogging and sharing SOME information online. I should have done my own research. But like the saying goes, “what you eat is what you are.” I don’t want to eat something from the food company that sells us something they don’t eat. Like the president of Eden Foods says, “I didn’t want BPA in food I was serving to my kids, my grandkids, or my customers.” This goes same to you. If you are not sure about the canned food you are eating, email the company and find out! It only takes a few minutes of your life to write such email. While other canned foods brands are trying to change their cans to BPA free ones, I don’t understand why Whole Foods’s 365 brand is not going BPA free… Maybe there’s a shortage of BPA free cans just like the WF’s rep has written. But I’m a bit suspicious about that. Hope WF will change its mind and offer 365 brand’s foods in BPA free cans, like NOW! Luckily, we have more alternatives like Eden Foods and TJ’s and all 🙂 If you get a chance, email Whole Foods! Let them know you want 365 brands to be BPA free! Thanks for the comments, Rebecca! Farmersmarketfoods.com is also bpa free. I purchase their organic canned pumpkin in grocery stores. You can find it under their FAQs. Thank you for posting this information. I have already printed off the cheat sheet and I have it in my wallet! Sorry for the super late reply! And thank you for leaving a comment, Melissa! I’ve never heard of FarmersMarketfoods.com before! I’ll add it to my list! In fact, it’s been almost a year since I posted the list which needs to be updated soon 🙂 I’ll update the cheat sheet, too! As seen on Rodale.com: “BPA Free” is appearing on a growing number of plastic food containers, food service items, and canned food packaging (nearly all canned foods contain a plastic lining made from BPA), hoping to lull shoppers into a sense of security that the food packaging isn’t leaching a toxic chemical linked to reproductive problems, heart disease, and some types of cancer into their food. Those items may not be leaching BPA—but they could be leaching some other damaging chemical. A study published in the journal Environmental Health Perspectives found that all plastics leached chemicals that interfere with your reproductive system, some even more potent than BPA. To get the real thing: Opt for products packaged in glass or aseptic cartons (like those used for boxed soups and soy milk), and bring your own glass or stainless steel to-go containers with you when you eat out. There is one exception to the BPA-Free claim you can trust: Eden Foods. That company packages its beans, rice and chilies in BPA-free cans that are lined with a plant-based (plastic-free) resin, and is currently the only company in the US that does so. Sorry for the super late reply, Charissa! You are so right about “BPA Free” containers! BPA is just one of the chemicals that plastics contain. Other chemicals still DO leach into our foods and beverages if we keep them stored for a long period of time. We are so used to the convenience of the canned foods and the plastic containers. It’s a bad habit. I think we just need to get used to a new way (or an old school way for some stuff) or a better way to keep us and this planet healthy 🙂 It’s too bad that consumers like us need to to the research before buying products… Hope this BPA Free Canned Food Brand list helps some or a lot of consumers. I should start emailing those companies again and get the updates! It’s overdue! Thanks for the comment, Charissa! I am grateful to you for this thought- provoking information on BPA which is a great public health issue. I suggest a tri-partite forum involving industry(both canned food manufacturers and empty can manufacturers), consumers and regulators dialogue to bring a closure to this debate for our collective health safety. Anyway, I heard the EU is banning the use of BPA cans for all products by 2013, is it true? As for the BPA in the EU, a lot of non-profit environmental/food related websites have been saying “why the US can’t ban BPA while it’s already been banned in EU and Japan.” But that’s not true. I’ve heard that the EU and Japan have been very strict about the amount of the BPA use for the cans and everything for a long time – Max is 60 parts per billion in EU and Japan, and 600 parts per billion in the US. So if that news about EU is true, that’ll be awesome! I have to look into it. Thanks for the info, Christian! That’s becuase the EU is smarter than we are… .they also ban GMO foods. We really need to adopt more to their policies and house clean our FDA who is doing nothing for any of us. Pingback: The First 5 Tips to GREEN UP Your Child’s Diet – and Yours! I really wish they can just use glass jars. But I’ve heard that it’ll cost a lot more to do that because (1) glass jars are more expensive, (2) they take more space in the box (with the dividers and all for transportation) and on the shelf, and (3) they are so heavy that manufactures have to pay more for the transportation (gas)… And a lot of consumers would not like the price for this change. Not everyone understands the hidden cost for the BPA lined canned foods ;( BPS seems to be used for paper and hard plastics. Not sure if they use it for cans… Hope they don’t. In any case, glass jars are still the best option for sure! What about Fresh & Easy Brands? Anyone know? My wife is obsessed with Peaches in Pear juice right now. I’m thinking about buying them in glass from Costco instead. Yes, please fres & easy bpa info would be appreciated! Oh! I forgot about Fresh and Easy! It’s not in my neighborhood. But I DO buy stuff from F&E sometimes on the way to my friends’ places. So yeah! I’ll email them and see if they reply to me 🙂 Thanks! Joe, So sorry for the super late reply! I’ve been super busy and away from this website… 😦 Anyway, I sent a message to Fresh and Easy today and got the reply today! Unfortunately, your wife’s fave peaches in pear juice (yum!) is NOT in a BPA free can… 😦 Only the organic beans are in BPA free cans. Hope she liked the ones in glass jars from Costco. Starkist and Chicken of the Sea is the same. Apart from soft drinks, theres probably more exmaples of cans without BPA than there are ones with. Did you ever hear back from Vons concerning the O organics brand? Pingback: Widespread Obesity: Are Certain Chemicals Also a Big Contributor-2? Pingback: Working in an Office – Part 1 | Passport to a Healthy Me! Pingback: Real Meat Sauce | Whole Food. Real Food. Good Food. The industry has responded to criticism of BPA by promoting “BPA-free” products, which are made from plastic containing a compound called bisphenol S (BPS). BPS, which shares a similar structure and versatility to BPA, is now being used in everything from currency to thermal receipt paper, and widespread human exposure to BPS was confirmed in a 2012 analysis of urine samples taken in the U.S., Japan, China and five other Asian countries. Almost all commercially available plastic products we sampled, independent of the type of resin, product, or retail source, leached chemicals having reliably-detectable EA [endocrine activity], including those advertised as BPA-free. In some cases, BPA-free products released chemicals having more EA than BPA-containing products. A 2011 study found that people are being exposed to high levels of BPS in cash register thermal paper receipts and many of the other products that engendered concerns about the health effects of BPA. The researchers found BPS in all the receipt paper they tested, 87 percent of the samples of paper currency and 52 percent of recycled paper. The study found that people may be absorbing 19 times more BPS through their skin than the amount of BPA they absorbed when it was more widely used. According to a 2013 study, BPS shares similar problems to BPA in that it has been found to be an estrogen hormone disruptor even at extremely low levels of exposure. Bravo for listing this info. It’s one of the most comprehensive I’ve found. Thank you for doing this! Please help with pet (cat) food safe packaging. Pingback: Real Italian Wedding Soup | Whole Food. Real Food. Good Food. I just recently became aware of the extensive products using BPA and the dangers. Thank you for the time and effort put into investigating so many product lines. Pingback: Sloppy Joe Meatballs | Whole Food. Real Food. Good Food. Pingback: Real Chili | Whole Food. Real Food. Good Food.